Let’s start things off with a quick history lesson. Windjammers was a sports title (sort of) released back in 1994 on the Neo Geo arcade system. It was a fast-paced Pong-like affair where instead of two sticks and a ball you had two sports stars and a Frisbee. Put simply it’s one of the most addicting two player arcade experiences I’ve ever had the joy of playing. Fast forward 20ish years and gaming site GiantBomb would feature the game consistently in their coverage causing an almost Renaissance in the product. So much so that the PlayStation 4 would even see its own port of the game just last year. Now, while the Nintendo Switch hasn’t been fortunate enough to get Windjammers on the Nintendo eShop (yet) it does have Disc Jam, a modern take on the 1994 classic and a fairly decent one at that. 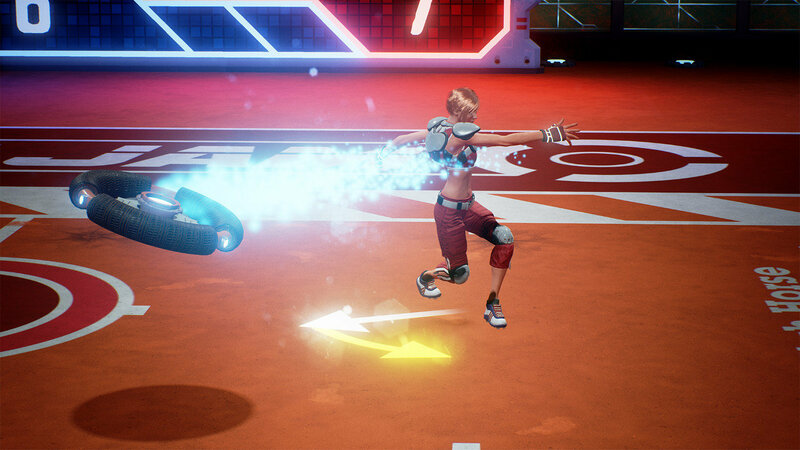 The basics of Disc Jam feel like a cross between Tennis and Pong; two teams throwing a disc back and forth across a court, the aim being to slip one past and score points. Throws come in many forms whether it’s straight and simple, a lob or even bouncing it off the sidewalls. Well timed button presses will reward the player with a faster return while spinning the analogue will also add some curve to your toss making predicting its trajectory even more difficult for your opponent. Special moves are also possible and add even more chaos to the mix. For the most part, the game controls well outside of a few instances where what I was inputting didn’t necessarily correspond with what was happening on screen. Not game breaking but a little annoying when for example your spin doesn’t go where you intended. Just like tennis, games can be played in singles or doubles, both fun options for their own reasons. The former for instance feels like the far purer experience where timing and reflexes are key, while the latter adds a small element of chaos to the mix by throwing in a couple of extra players. Matches consist of three games each a race to score fifty. Interestingly the length of a rally dictates the number of points awarded to the victor – every return adding another point to the pot. It’s a unique system and one that can change the swing of things with one single play making matches often unpredictable and tense. In terms of single-player options, the tutorial is a great way to pick up both the basics and more technical strategies needed to become a dominant force online. Beyond that, though the wealth of modes doesn’t stretch very far outside single matches against A.I. controlled bots or ones based off of players found online. Online fares slightly better, if only for its human opponents that for the most part were easy enough to find. Again though your options are slim in terms of variety and unlocks handled in a pretty poor way (but more on that later). With the Switch being a portable system as well as a home one, chances are you’re not always going to be somewhere you can get online. Thankfully the game includes local multiplayer options be it through multiple systems or simply split-screen. Whether playing online or with friends locally, Disc Jam manages to draw you back in for one more game. Matches are often competitive and sometimes even come down to the final rally making for some truly heart-pounding moments. As fun as the actual game part of Disc Jam is sadly the actual content side of things lets the whole package down. First of all, there is only one court to play on – a fairly standard, futuristic looking arena. It would have added a little more variety by simply throwing in a couple different locations or even some obstacles like bumpers to the actual court itself. As I mentioned before the list of modes leaves a lot to be desired and the character list doesn’t fare much better totalling at just six, two of which need to be unlocked for online play. Which brings me onto perhaps one of my biggest gripes with the game – the way it handles unlocks. While all characters, emblems, tags, discs and the like are available to use in local play, if you want to use them when facing others online, you’ll need to unlock them. A task made all the more taxing thanks to not only the drip-feeding of currency but also the fact that unlocks are completely random. What makes this worse is that Disc Jam is one of the few games on Switch to include microtransactions as a shortcut for those who want the extras quicker. Two of the six characters require an obscene amount of credits to unlock as well, practically begging players to pay the extra cash. It’s a gross situation and one that really hurts the online appeal of the game. Visually Disc Jam isn’t anything special, the futuristic setting fairly generic and not helped by the fact there’s just the one arena to play in. Characters likewise fail to stand out in any real way. The way they ragdoll when losing a point is also weird and feels totally out of place. Disc Jam offers the ideal balance of simplicity and depth you’d want from an arcade-like sports experience. The action is fast and matches often tense but sadly the overall package is let down by some rougher edges and gross microtransactions. Windjammers might still reign as king of the fake Frisbee-style sports genre but Disc Jam is a decent enough imitation for the Nintendo Switch.